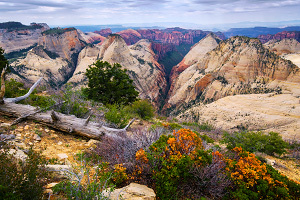 Compared to some larger national parks, Zion is relatively small and doesn't have the numerous multi-day hike options like Yosemite or Glacier National Park, but there are several two-day backpacking routes that offer wonderful scenery and solitude, including the West Rim Trail and the La Verkin Creek Trail. 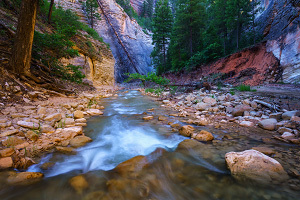 Also gaining epic popularity is the "Trans-Zion Trek" (also known as the "Zion Traverse"), a 47-mile hike that connects several different trails to hike from one corner of the park to the other. It is important to note that backpacking at one of the wilderness campsites is not the same as camping at the large campgrounds. While staying at the Watchman Campground or South Campground is more of a social experience with several amenities and facilities, the backpacking campsites along Zion's remote trails are intended for smaller groups doing long hikes in Zion's wilderness. A wilderness permit is required for any overnight hike and you must stay at your designated campsite. Some campsites are available for online reservation several months in advance, but other campsites are only available to walk-ins the day before or of your hike. Even if you have an online reservation, you must visit the Wilderness Desk to get your actual permit. See the NPS website for more information. Wilderness campsites are primitive. No open fires are allowed and there are no facilities, restrooms, or garbage cans. Pack out all of your trash and leave the site clean for the next group. Do not squat or poach any campsite that you don't have a permit for. During the height of the tourist season, almost all of the campsites get booked for every night. If you pitch a tent at the wrong campsite, you will ruin the experience for others who were expecting to get away from it all. Rangers do often come around and check permits. Limited at-large camping is permitted in only specific zones within Zion National Park (and you still need a permit). 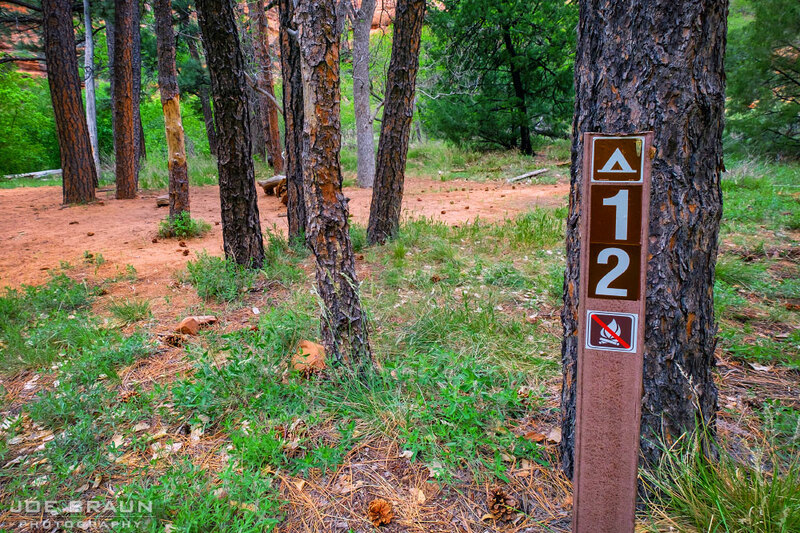 Some of these zones include the east plateau off of the East Rim Trail as well as sections of the Kolob Terrace off of the Northgate Peaks Trail and near Wildcat Canyon. See the NPS Wilderness Map for more information. Starting from Lava Point, the 18-mile hike down the West Rim Trail to the Grotto in Zion Canyon is a great adventure, either as a long day hike or as a two-day backpack. While most of the trail is level or downhill, it is still a long journey and should be considered fairly strenuous. The "top-down" hike is aesthetically pleasing as the scenery starts out fairly subdued, but each viewpoint gets better than the last until the grand finale of the trail making its dramatic descent through the White Cliffs into Zion Canyon. 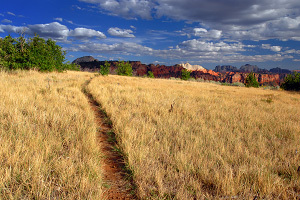 Starting from Chamberlain's Ranch outside the northern corner of Zion National Park, the North Fork can be hiked top-down from the upper plateau. This is the longer and less popular way to hike the Zion Narrows, but it is quite a rewarding experience to see the more subtle beauty of the the upper North Fork as it slowly transforms into the majestic and deep slot canyon that opens into the main canyon in Zion. This route is usually done as a two-day backpacking trip and is a magical experience. 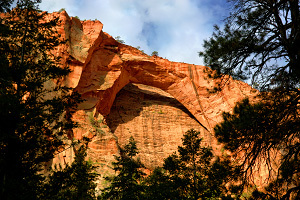 The La Verkin Creek Trail is the main through trail of the Kolob Canyons section of Zion. Starting at Lee Pass along the Kolob Canyons Road, this trail runs almost 11 miles in length, looping south around the Finger Canyons, then turning east to join up with La Verkin Creek. The La Verkin Creek Trail is most used for day hikes to the famous Kolob Arch or as part of a backpacking hike along the Trans-Zion Trek. A leisurely two-day backpack offers more opportunities for exploration. Rating: fairly strenuous dayhike or backpacking. While there are many hiking possibilities in the "desert section" of Zion National Park, the Chinle Trail is the one official trail of the area. Starting in the "Anasazi Plateau" residential development, the trail heads northwest up onto the Rockville Bench and into national park lands. The trail continues for roughly seven miles, crossing over a petrified forest and several washes of the area: Huber Wash, Scoggins Wash, and Coalpits Wash. 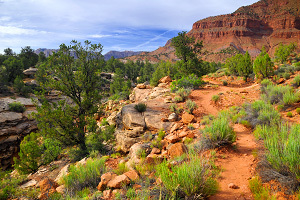 The trail can be brutally hot during the summer and the scenery is less exhilarating than most other parts of Zion, but this trail is an opportunity to get away from the crowds. Rating: strenuous 3 to 5-day backpacking. 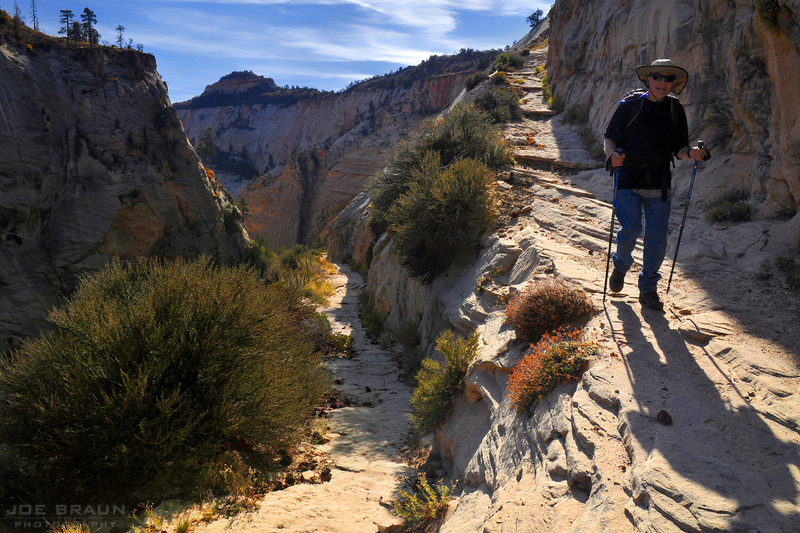 A route made popular by the outfitters in Springdale, the "Trans-Zion Trek" is a multi-day backpacking hike that connects several of Zion's trails into one long route from one corner of the park to the other. This strenuous and beautiful hike can take on average between three to five days and involves a lot of elevation gains and drops. Along the way, you will see some of Zion's most awe-inspiring scenery as well as many beautiful spots that most dayhikers never experience. NOTE: This route has gained epic popularity in recent years, so competition for permits is fierce; please have a backup plan.